This punchy pink blend of pomegranate, berries, apple and hibiscus is magic iced, fabulous hot too! Sure to be your new iced tea favourite. 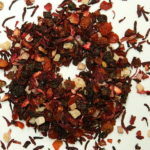 A delicious fruity blend, perfect for iced tea.